Have you heard this one from your family and friends? I have, but the research doesn’t support their concerns. Many of my friends/family worry that ultrarunning is bad for my heart because it has to work for extended periods of time, like 36 hours, at an elevated rate. The research shows that there is short term stress (duh) but there are no long term negative effects on the heart. 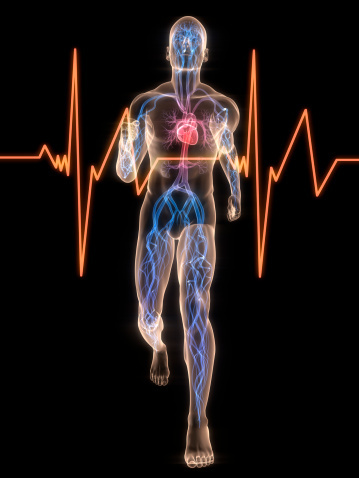 Overall, ultrarunner’s hearts are normal and often more healthy than the general population. The most chronic ailments ultrarunners suffer from are allergies and exercise-induced asthma. On average, ultrarunners miss 2.2 days of work a year for illness. It’s 3.7 for the national average. All those people concerned about your knees, tell them to rest easy the research doesn’t support that or damage to other joints or cartilage. Yes, runners get injured. They pull muscles and tendons and sometimes they get a stress fracture. What athlete doesn’t get hurt at some point, even recreational athletes (aka not extreme)? Sounds like optimal health status to me. I’ve heard ultrarunners say they want to be healthy and they may have started running to be more healthy. Many of them eat well and take care of their bodies, but I believe it’s more of a taking care of the body to run 100 miles and not running 100 miles to take care of the body. If it can get so tough out there, why do we do it over and over again? Because crossing the finish line of a 50 or 100 mile run is remarkable. The more difficult the race the more we love it. We earn ever belt buckle we have. We run into hell with a smile knowing it’s going to get hot, we’re going to get burned, and we’re going to want to die. We do it because we refuse to believe we won’t come out on the other side. We stare down our demons, pull on the boxing gloves and go round after round after round. We’re fighters. When we get knocked down we get back up and keep going toward our goal. The true benefits of running Ultras: mental fortitude and the belief that you can. Previous Article Do you run in the winter? Next Article How Does Age Affect Running? Loved this blog! That’s who you are! Thank you for this! I don’t even run ultras but I get so much stick from family and friends about marathons or even just a regular training week. I think it’s just a lack of understanding and a common myth. Great blog, it was almost like a pep talk, not that I need it right now, give me a month into training maybe. Keep running, and writing, thank you for all the great information.